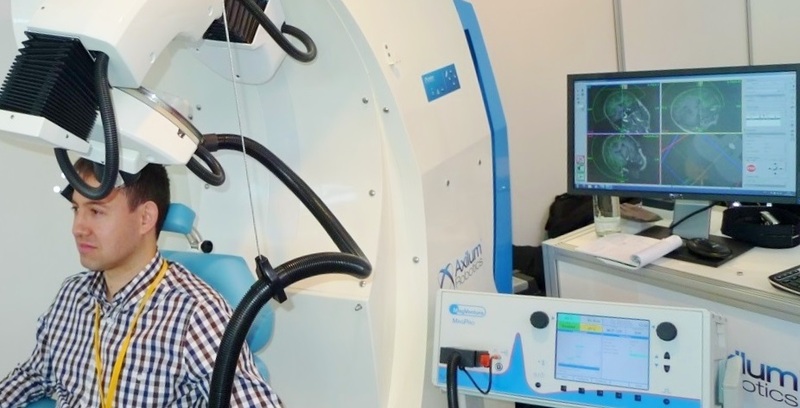 Axilum Robotics TMS-Robot, in combination with a compatible neuronavigation system and a compatible coil connected to its stimulator, offers a full robot assisted TMS system allowing the automatic execution of an image guided TMS session planned in advance. Whether you are looking for a complete TMS system or a robotic assistance to your existing TMS system, Axilum Robotics can provide you with the best solution for your needs. This page contain information about the compatibility of TMS-Robot with other TMS equipments. Axilum Robotics has established partnerships with leading manufacturers Localite, Rogue Research and Syneika to ensure a seamless integration of TMS-Robot with their products equipped with an optional Axilum Robotics TMS-Robot supervision module. The fully integrated TMS system takes advantage of the 3D optical tracking system provided by the neuronavigation system. Axilum Robotics TMS-Robot connects to a compatible neuronavigation system using a simple Ethernet cable. Available functionalities depend on compatible neuronavigation systems and their software version. Click on a logo for compatibility details. More information on compatible neuronavigation systems available on request. Axilum Robotics has established partnerships with leading manufacturers Mag & More, Magstimand MagVenture to ensure a seamless integration of TMS-Robot with their TMS cooled coils. Mechanical adaptors ensure stable, safe and calibrated mounting of TMS and rTMS coils onto the robotic arm. Flat force sensors, designed by Axilum Robotics are fixed to the inferior surface of the compatible coils. More information on compatible coils available on request. Compatibility has been verified with Neuroelectrics Enobio/Starstim EEG device and Brain Products BrainCap/BrainAmp EEG device. About testing of Brain Products EEG device, results have been published in journal NeuroImage in July 2016: S. Harquel et al., Mapping dynamical properties of cortical microcircuits using robotized TMS and EEG: Towards functional cytoarchitectonics, In: NeuroImage, Volume 135, pages 115-124, July 2016. To read more: Download the article of S. Harquel et al. (PDF). Axilum Robotics TMS-Robot does not induce additional artifacts. To read more: Download Neuroelectrics’ White Paper (PDF). More information about the compatibility with EEG measurement devices available on request.